When it comes to mini blinds, you do have options. Unfortunately, many people do not realize what those options are. There are too many to discuss in one tiny blog. However, we can start at the basic difference between custom blinds and premade blinds. Window shadesare not just for the home. They work great in workshops and playhouses as well. If fact, a good window treatment can make the area more comfortable and easier to work and play. Many people take the chance to replace mini blinds as an opportunity to redecorate the room or even the home. While this is a good idea, you will want to be careful of these mini blind mistakes. Roman Shades: Which Material is Best for the Kitchen? You want to add roman shades to your kitchen but you are not certain which ones to get. While you have many options, only a few are good for the kitchen. "Miniblinds are great for some people but …" is the way many miniblind myths start. Who knows how they got started but we are here to bust them today. Read on and discover myths that you thought were real. Wood blinds are not only durable they have many functions. You can use them in almost any situation to create the perfect look. Vinyl mini blinds are the perfect choice for waterfront living. Whether you live in a lake house, own beachfront property or live in a boathouse, vinyl blinds are the way to go to add beauty to your home. During the recession, more and more people are looking to ways to make money at home. In doing so, they often find the kids' room would make a perfect home office, if they could change the windows shades, paint, add a desk and a few other things. Many people mistakenly think that when you order wood blinds, that your only color options are light brown and dark brown. Nothing could be further from the truth. Wood blinds come in a wide array of colors and when you add the decorative tape, you have almost limitless choices. Wood miniblinds and wood shutters are becoming a more and more popular window treatment in America. However, the cost of real wood blinds leave some people standing out in the cold. This does not have to be the case. Faux wood miniblinds can give the same effect at a fraction of the cost. If you think you have to buy sub-standard mini blinds in order to get them cheap, you are sadly mistaken. It is possible to find mini blinds and other window treatments at discount prices and still receive a high quality product. However, you have to know where to look and what to look for in quality window treatments. Do you love the look of woven wood roman shades? Do you admire the fragile look? Are you concerned that they would not do well in your house? While real woven wood roman shades do have a tendency to warp and fade when exposed to direct sunlight and water, this is not true with their polyester counterpart. Many people love the look of real wood blinds. In the past, you did not have many options. However, now you have so many options it can be hard to choose. Deciding on which blinds you want can quickly become overwhelming. We want to make this decision easier by giving you a comparison guide. Single and double cell window shades provide insulation on any budget. With so many options and so many styles, if you want to save on your energy bill, then selecting the perfect window shade is easy on a variety of budgets. Is it time to replace your old worn out blinds and window shades? Did you start looking for the replacements and get overwhelmed with the many options? If you need help sorting through your options, then this guide is perfect for you. A lot of people have been talking about faux wood blinds. Why? Because these are like the cheap cousin to wood blinds. They look the same, act the same, actually, they are even easier to maintain than real wood blinds and cost only a fraction of the price. We know everyone is looking to save some money after the holidays but repairs need to be made and upgrades need to happen. What better way to start your year off than with a fantastic looking house where you can entertain as much as you like! Roman Shades: What Makes Them Different? If you have been looking around for window treatments, then undoubtedly you have come across Roman shades. However, you may not know what makes Roman shades different from other blinds. Since this is a popular question, we have decided to give a brief description of what makes Roman shades so unique. Anyone who has ever owned miniblinds knows that they can get real dirty. Dust builds up and some kind of weird films gets on the blinds. For most of us, this happens because we either do not know how to clean the blinds or don't take the time to do it. However, keeping your miniblinds clean will make them last longer and keep them looking and working like new. Many times people choose miniblinds just because of their price. However, you need to be careful in your selection. Just because you are buying your miniblinds on a budget does not mean you need to get cheap blinds that won't last. Here are some suggestions on making sure you get quality blinds at a discount. 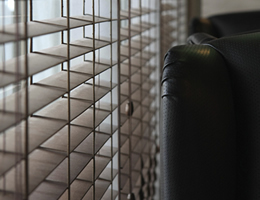 You can save yourself some time and money if you take the time to properly care for your mini blinds. This may sound a little too much like a mother hen, but you can add years to your blinds simply by doing an occasional thorough cleaning. Spring is fast approaching and with it brings spring-cleaning. People go around their homes looking for ways to give it a fresh clean look. Nothing can make your home look fresh and new like window shades. They come in a wide variety of styles and colors making it easy to match any home décor. 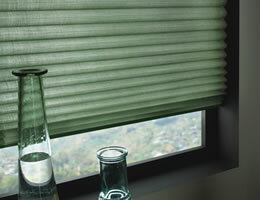 We have just added pleated shades to our website available in both light filtering and room darkening fabric. Both versions come with "no holes privacy". No holes privacy pleated shades are different than standard pleated shades in that they offer no visible holes through the front of the shades. Each pleated shade is designed with a tab on the back of each pleat through which the lift cords run. This upgrade offers better light blockage and more privacy. Do you like the look of Roman shades but are concerned over recent safety recalls? It is possible to install Roman shades anywhere in your house, including the nursery, without fear of injury to your child. You have three safe options for your home and nursery. Add privacy and elegance to your French door with wood blinds. With just a few simple measurements you can increase privacy without sacrificing style. You will need to know a few things to get the proper fit. Blinds Chalet has just added a new rustic look wood blind. Our Distressed 2" Wood Blinds are designed with an antique flavor. Each basswood slat as well as the head rail and bottom rail are distressed to look old and rustic. Whether you need blinds for your cabin, office, or home, our distressed wood blinds are sure to add that antiqued rustic feel to your decor. During these cold winter months you may be thinking how can I save on energy bills. Windows account for 50% of the heat loss in a home. Insulating your windows can drastically decrease the energy lost through your windows. 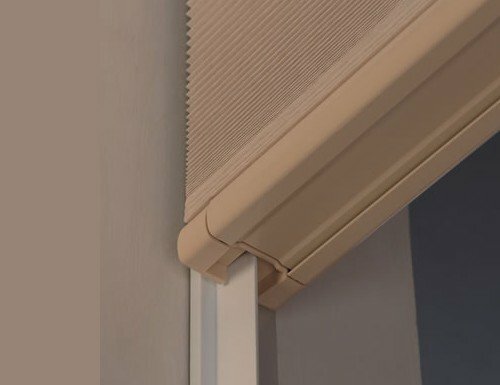 With the unique sidetrack system, our EnergyTrack cellular shades (identical to ComforTrack cellular shades) add an additional barrier to the cold similar to zipping up a winter coat. What is a single cell honeycomb shade and what is a double cell honeycomb shade? Cell shades are designed to insulate from the heat, cold and noise. The fabric is designed in a "cell" or "honeycomb" pattern as visible from the side of the window shades. From the side of front of the shades they appear as a pleated shade with an accordion style look to them. The cells of the window shade trap air and provide insulation.